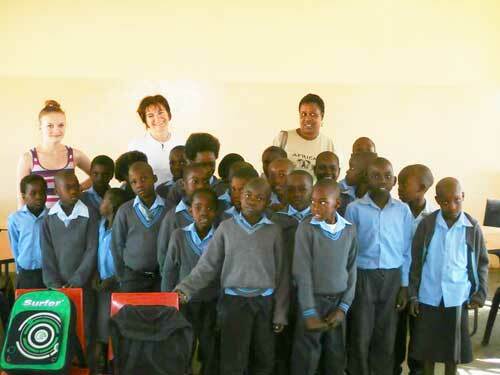 We recently visited Mabele School on our trip across Botswana, last August. We were very exited about it, as we had been preparing all the supplies and goodies for several months, collecting from our family and also from work colleagues. When I came to the office one morning, my desk was full of clothes, school supplies, shoes, etc. We flew to Johannesburg with 2 huge bags of approx. 35 kilos. 2 weeks after we flew to Africa, we arrived at Mabele School. We could no longer see the Headmaster desk, after emptying the bags, whose contents were: school supplies, rugby balls, puzzles, board games, clothes, shoes, gym shoes, colored pencils and more. Then, we were invited into 3 different classrooms where we were welcomed by little and cute singers and dancers! This was a great and emotional experience which I will always remember, and that I brought back to my country in my heart.